This is a bespoke single tier wedding veil price list. You can choose the length and the lace trimmings, the satin bias tape trimmings, or no trimming. If you would like to see the colour first, please go to the sample fabric & trimming swatches page. The lace trimming veil takes 14 working days, and the satin bias tape veil and the no trimming veil takes 7 working days, after you order. 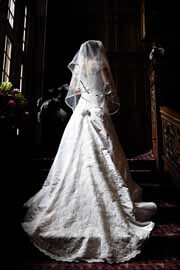 If you would like to know more about the veil length, please visit veil length and width page. This is a bespoke 2 tier wedding veil price list.